There is no saving GM's Oshawa, Ont., plant the automaker says. DETROIT — General Motors reaffirmed to both the Canadian and Ontario government this week in Detroit that it does not have a viable business case to maintain production at its Oshawa, Ont., assembly plant. The automaker met with Canada’s economic minister, Navdeep Bains, on Monday evening and Ontario Premier Doug Ford on Tuesday, telling both it still intends to stop allotting product to the plant northeast of Toronto at the end of 2019. Ontario Premier Doug Ford on Monday called on General Motors to extend production at its Oshawa, Ont., assembly plant until at least the end of its contract with Unifor in September 2020. Ford’s comments came as Navdeep Bains, federal minister of innovation, science and economic development, wrapped up a meeting with GM CEO Mary Barra, who told him GM had not changed its position to end production at Oshawa by year’s end. But, GM should fulfill its contract with Unifor, said Ford, who met with Unifor President Jerry Dias earlier on Monday during the first day of the Detroit auto show press days, and was scheduled to sit down with GM executives Tuesday. Ford appeared to soften his previous stance on Oshawa as a lost cause following the Unifor meeting. Shortly after GM made the announcement in November, Ford said GM was “gone” and that there was nothing the government could do to change that. As well, Todd Smith, Ontario’s minister of economic development, job creation and trade, reiterated to Automotive News Canada on Monday that the government did not think Oshawa could be saved. Still, the premier signalled that he was skeptical those efforts would result in a change of plans at GM. Ford, who campaigned on ending “corporate welfare,” said the Ontario government would be willing to offer financial incentives for GM to stay at Oshawa. GM has rejected several such offers, he said. “We’ve went down that avenue with them four times, and they’ve declined every single time,” he said. The premier said his meeting with Dias was “very productive.” The two have had a contentious relationship dating back to Ford’s 2018 campaign, culminating with Dias cursing at the premier during a televised speech in December. Dias also softened his tone with Ford following the meeting, saying he’s confident the premier will fight to keep Oshawa production going beyond 2019. “After some good engagement, I think he has a better understanding, now, of the industry,” Dias told reporters. GM is also facing pressure from the federal government. In a statement following his meeting with Barra, Bains said GM had not changed course on Oshawa. He said earlier in the day that all federal options were on the table. 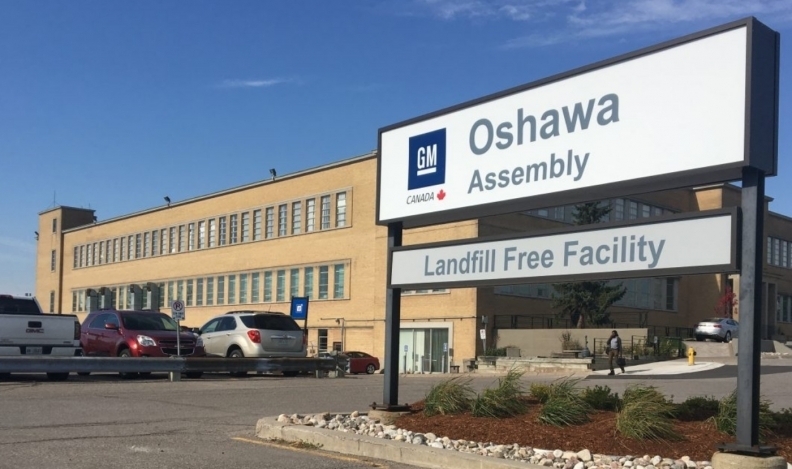 The Oshawa plant builds the Cadillac XTS and Chevrolet Impala sedans and does final assembly on previous-generation Chevrolet Silverado and GMC Sierra pickup bodies shipped from the United States. The automaker plans to end one of the pickup shifts at the plant in the summer, followed by the other truck shift and the sedan line around the end of 2019.